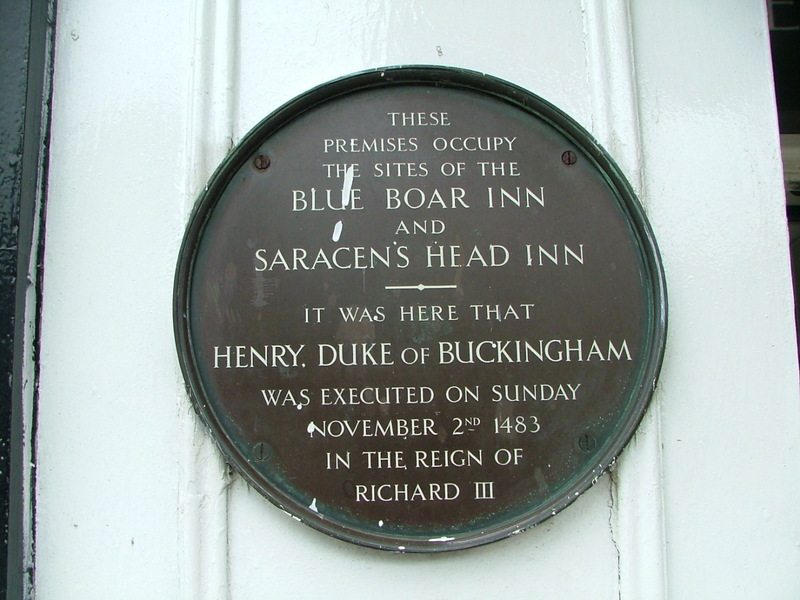 I recently visited Salisbury in Wiltshire and stood by the plaque which commemorates the execution on 2nd November 1483 of Henry Stafford, Duke of Buckingham on the site of the Blue Boar Inn. His ghost is said to haunt Debenhams which stands on the ground where he was publicly beheaded for treason against his King on that chilly Sunday so long ago and yet so near to those of us who live some portion of our lives in the C15th. I spent a few moments trying to clear away the traffic furniture and buses and clinically decorated perfume aisles through the plate glass and imagining what it was like to stand in that market square with a sense of dreadful anticipation, waiting to see a peer of the realm be brought out and meet his fate. There are a few medieval buildings around the square which date to the C14th and would have stood witness to the event. I wonder what the mood of the crowd was on that day, in the turbulent and troubled days of Richard III’s first year as king. Were there misgivings about this execution? Was there sympathy for the prisoner or relief that another plot had been neutralized? Did the crowd think silently about his knowledge or part in the fate of the princes in the Tower as they waited to see him die? Buckingham had tried to flee to Beaulieu, hoping to get passage from Buckler’s Hard to France to throw in his lot with Henry Tudor, who’s planned invasion had been foiled by stormy seas. Buckingham had begged to speak with Richard. Why? To plead his case, to try and explain why he had betrayed the trust that Richard had placed in his ‘ally’ since their fates were brought together by the death of Edward IV in April of that year. Richard refused to see him, ‘the most untrue creature living’ and ordered his execution. We can still see evidence of the anguish of his emotions in the letter which survives relating to Buckingham’s treason. The orderly secretary hand of John Kendall is violently interrupted as Richard seized the quill and poured out his anger across the page, turning it side-ways to continue in the margin. How could Buckingham ever imagine that he would have talked his way off the scaffold? North-West tower at Farleigh Hungerford which stands next to the family chapel. The following day I visited the ruined fortified manor house of the Hungerford family near Norton St Philip which lies about 30 miles to the north of Salisbury. Farleigh Hungerford is both familiar and well-loved as I used to play in the evocative ruins as a child and knew about the association with Richard III and his family. The Hungerfords rose to power and wealth under the patronage of John of Gaunt. Sir Thomas Hungerford was his loyal servant and the family continued to prosper under the Lancastrian kings. Then came the turmoil of civil war and Robert Hungerford, 3rd Baron fled first to York and then Scotland after the bloodbath of Towton with Henry VI and Queen Marguerite. 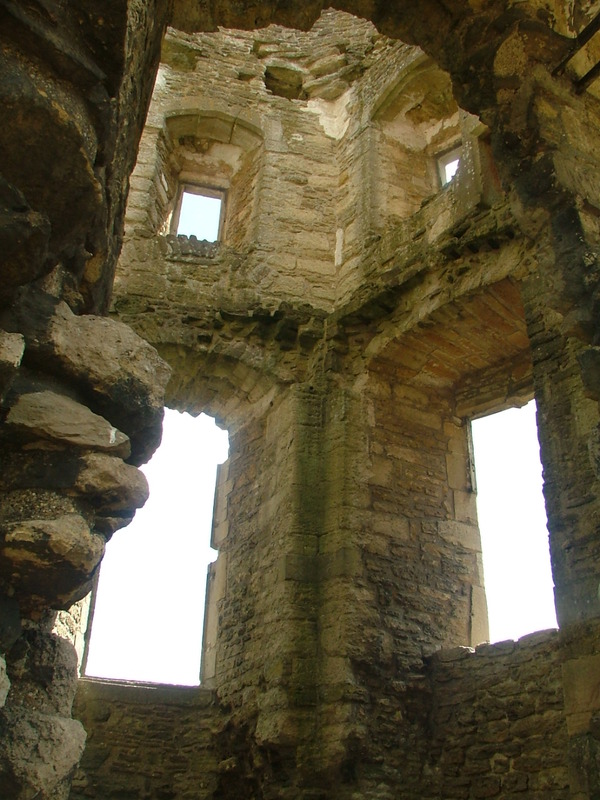 His life was a catalogue of failures and flight, capture and escape having been held in France for seven years for a large ransom after the Siege of Chastillon only to return to England to follow the disastrous fortunes of Henry VIth but his ‘luck’ finally ran out at the Battle of Hexham where he was captured and then taken to Newcastle for execution in 1464. 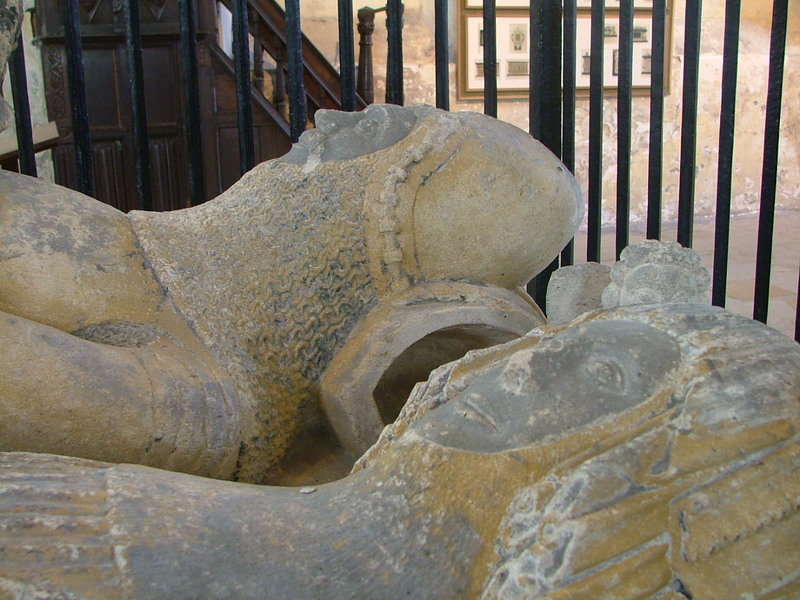 His effigy tomb is in Salisbury Cathedral and is a fine example of the English style of decorated plate armour with its scallop shell grooves and delicate alabaster veins. Despite bankrupting his mother to ransom him there was money enough for a good image. Robert’s eldest son, Thomas Hungerford of Rowden took up the family’s destiny and, for a time, seemed to have favoured the House of York but chose to join the Warwick Conspiracy to restore Henry VIth to the throne. He was attained in 1469 and found himself bound for Salisbury market place to die the death of a traitor to the crown. Thomas was hung, drawn and quartered, probably on the same spot as Buckingham found himself fourteen years later. Almost impossible to imagine the scene of this execution in a prosperous market and cathedral town just a few streets away from the spire that would have dominated the skyline of medieval Salisbury and under which is housed one of the original manuscripts of the Magna Carta. We all know the process of a traitor’s death but the actuality of this fate for the person about to face it and for the family waiting to hear how they endured it or even for those townspeople who witnessed it is hard to encompass, standing on a busy modern street with your children beside you. Farleigh Hungerford passed to Edward IV’s youngest brother, Richard of Gloucester and his sister-in-law, Isobel Neville went there to give birth to her only daughter, Margaret of Salisbury in 1473. Another lady who ended her days on a scaffold! Two men then, caught up in the power play of great rival dynasties. Two men who faced hard choices and sought to weave a way towards success and stability but who misjudged the times and found themselves captured and attainted, their families under a shadow and their bodies subject to the full punishment of the law for their disloyalty to the House of York. The story doesn’t end there though. Thomas Hungerford had a younger brother called Walter who had been pardoned by Richard III in 1483 but who still harbored the old family loyalties to the House of Lancaster. He escaped Richard’s guards and made it to Henry Tudor’s camp on the eve of Bosworth, perhaps determined to have revenge for his brother and father. Walter Hungerford killed Sir Robert Brackenbury in hand-to-hand combat which suggests that he was involved in the final melee that claimed the lives of Richard’s household knights and brought down his king. He was knighted on the field of battle by Henry Tudor. This entry was posted on July 26, 2015 at 9:26 am and is filed under Uncategorized. You can follow any responses to this entry through the RSS 2.0 feed. You can leave a response, or trackback from your own site.